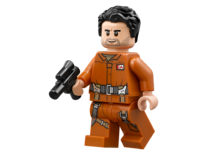 75188 Resistance Bomber is a Star Wars: Episode VIII set released in 2017. 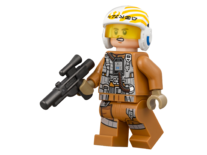 Model ship name is MG-100 StarFortress SF-17, which seems to be referring to the WWII iconic B-17 Flying Fortress, if compared with its oval-shaped machine gun window openings. 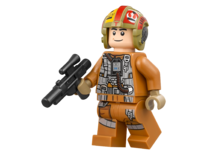 Set out on heroic raids with the Resistance Bomber! 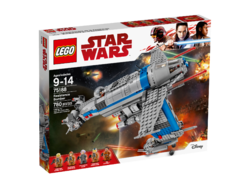 Play out action-packed LEGO® Star Wars: Episode VIII missions with the Resistance Bomber. 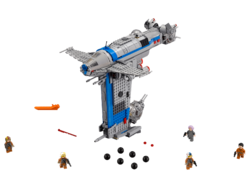 This feature-packed model includes a button-activated bomb release function, spring-loaded shooters, 2 opening rear gun turrets with space for a minifigure, elevating rear guns, a 2-minifigure front cockpit with detachable canopy and a removable top section for easy access. It can also stand on any even surface when not in use. 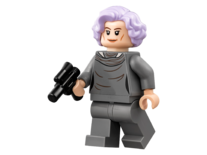 This set includes 5 minifigures. 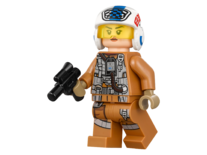 Facts about "75188 Resistance Bomber"